God's Trigger is a stylish, over-the-top isometric shooter that looks like the result of Hotline Miami being thrown into a blender with a heavy dose of angst. And more blood. Seriously – if you don't believe us, just check out the latest trailer for the upcoming game, where God's Trigger's ballet of violence is on full display. 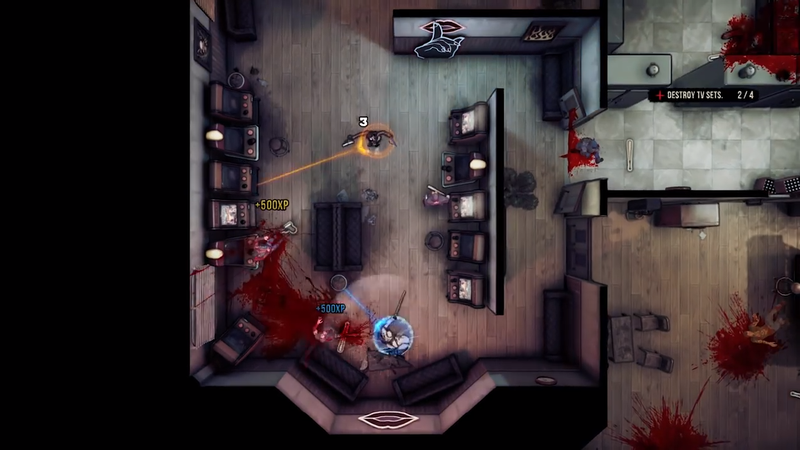 It looks like the spiritual successor to Hotline Miami 2 we've all been waiting for, and it features co-op to boot. "When an Angel and a Demon team up to kill their way into Heaven and stop the Apocalypse, bullets are sure to fly and blood will be spilled. Play solo or in co-op, make split-second decisions, dodge bullets, and use weapons and special abilities to dispatch violence in the most brutal way possible." So, yeah. Hotline Miami, essentially, but with angels and demons. You can blaze your way through a room clearing out enemies with swords, flamethrowers, acid guns, shotguns, and (quite surprisingly) holy hand grenades, like you're playing Worms or something. But you're not relegated to traditional arms at your disposal. You can also use angelic and demonic powers, customized to your liking, to eliminate every enemy in your wake. When the game says you can kill "everything," it really means it, too. Kill enemies, destroy furniture, doors, and entire structures if you feel like it. Then go do it with a friend in co-op as one character plays Harry and the other Judy. God's Trigger debuts on Xbox One, PlayStation 4, and Steam on April 18.